"Through realistic dialogue and concise, yet entertaining, chapters, He Who Dreams takes readers from a soccer field to the Grand Entry of a powwow with ease…Powerful and smart, He Who Dreams brims with valuable lessons, allowing young readers to access important issues in a highly engaging way. " 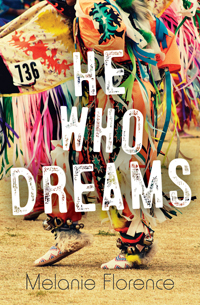 "He Who Dreams is a breathtaking read for anyone who enjoys dance, drumming, pow wows, and traditional aboriginal attire. Enjoy!" "The author...reinforces that she is capable of writing engaging stories about Indigenous subjects in any genre...John is an appealing character...Scenes between him and his parents and energetic younger sister, Jen, are especially well drawn...He Who Dreams offers readers a fast-paced story with realistic Indigenous content connecting the book to contemporary discussions about Indigenous issues in Canada." "Melanie Florence manages...to portray a realistic portrait of a young man trying to figure out what motivates him and where he wants to go while giving his story room to tell itself rather than trying to direct from the keyboard. Well done." "Florence effortlessly creates a very real and loving biracial family for her thoroughly modern protagonist. John's fast-paced tale twines universal teen concerns with specific cultural issues. This novel allows young readers to embrace their own heritages and realize they stand on the shoulders of all their ancestors."